Annual Survey of Hours and Earnings, ONS via NOMIS. The data is for 2016. What does this chart show? This graph shows pay inequality in each London borough by comparing the ratio of top and bottom pay. It compares gross hourly pay for the top 20% with the bottom 20% in each borough. The higher the pay ratio, the more unequal earnings are in that borough. The pay ratio in Tower Hamlets is 3.33, significantly higher than any other borough. This means that in Tower Hamlets someone just in the top 20% has pay 3.33 times higher than someone just in the bottom 20%. Hounslow has the next highest ratio, with 2.88, followed by Westminster with 2.76. Therefore in these boroughs, hourly pay for the top 20% of earners is much higher than for the bottom 20%. The most equal borough by this measure is Croydon, where the pay ratio is 2.29, followed by neighbouring Merton where it is 2.31, and Wandsworth where it is 2.33. The difference between boroughs in this measure is mostly due to the top 20% of earners. 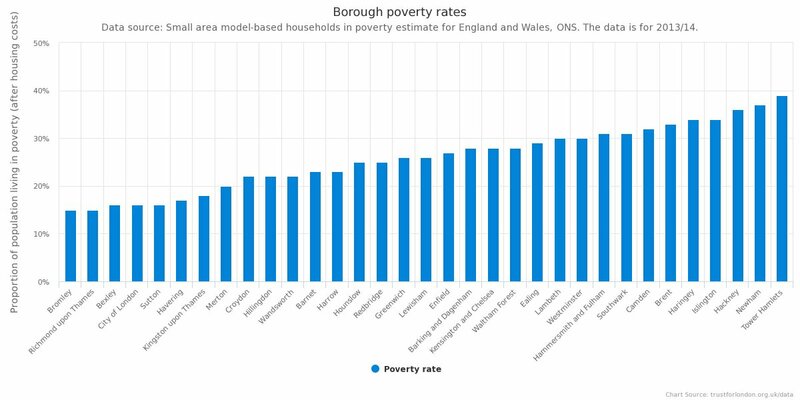 The borough with the lowest hourly pay at the 20th percentile is Enfield at £8 and the borough with the highest is Islington at £12, a difference of £4. 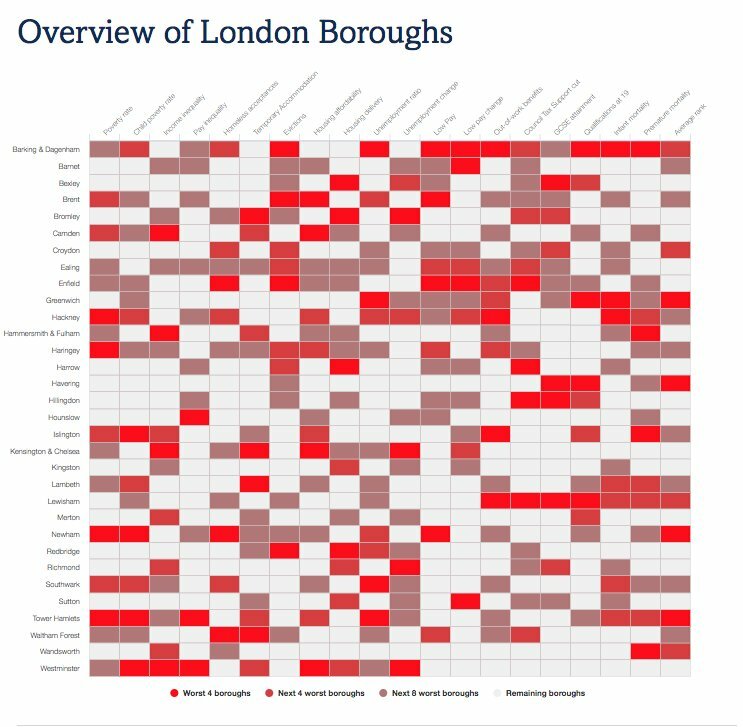 The difference in hourly pay at the 80th percentile between boroughs is much larger, going from £19 in Waltham Forest to £38 in Tower Hamlets, a difference of £19 . This measure differs from income inequality because it looks at the difference in hourly pay between those at the top and the bottom for individual employees rather than households. This measure does not take into account the earnings of others in the household or any other sources of income. The data comes from the Annual Survey of Hours and Earnings which means contrary to the income inequality measure it excludes those who are self-employed.